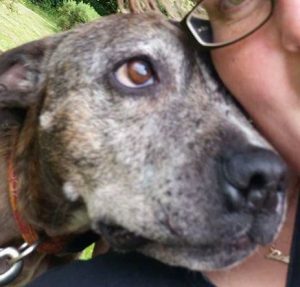 Lucy she finds herself back in kennels at Dunroamin K9 Rescue in South Yorkshire, as her owner became too poorly to look after her. 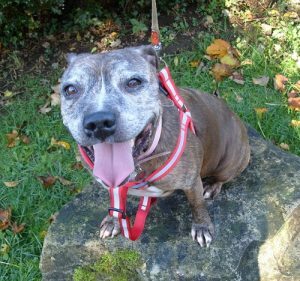 She’s a very affectionate, small Staffy girl who wants to be the only pet at home. 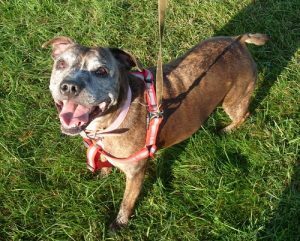 Lucy is obviously quite shocked at the moment with the massive change of life and just wants a settled home life again! 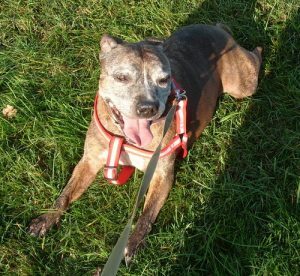 Lucy is good on the lead and will wait when asked, sit and give paw. She hasn’t been tested with other dogs nose to nose but when she sees them out while on a walk there are no issues. She’s so bright, she’d like to tell you about herself! “Hi, my name is Lucy. 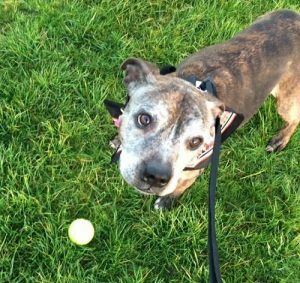 I am a people-loving Staffie with one wish – to find my forever home in time for Christmas! Everyone’s really nice here, but I miss having a proper home so much. I’m nine now. No one has chosen me yet, and this makes me feel so sad I’ve started losing weight. Or use their online contact form: click here. Please say you saw Lucy on the Oldies Club website.